Declining workforce productivity continues to dominate the headlines in the business press, particularly in Canada. Between that unsettling trend and a strengthening dollar, Canadian business is at serious risk of becoming even more uncompetitive, especially against US exports. When it comes to engineering ways to improve productivity, most leaders place a heavy emphasis on achieving task excellence. With metrics and programs such as Six Sigma, Lean and benchmarking, the quality of our work has certainly gone up. The problem is that focusing on task excellence alone is not enough. Failure to establish and maintain relationship excellence ultimately sabotages task excellence. Our research has identified a tangible force in organizations that we describe as “connection.” It is a bond based on shared identity, empathy and understanding. In most organizations, the ‘insiders’ – people with power and influence, those in management, and those employees who are recognized as “stars” – feel connected to one another and to the business… but the vast majority of employees do not share that feeling. Over time these un-connected employees stop caring, stop giving their best efforts, stop aligning their behavior with organizational goals and stop fully communicating. When people feel disconnected, Knowledge Traps abound. Knowledge Traps show up as silo behavior, personal rivalries and other forms of relationship failure that impede the flow of knowledge and information. A disconnected employee who has information that is contrary to management’s view or the consensus view tends not to take the risk of sharing it. When this occurs, decision makers do not have the information required to make optimal decisions. In such cases, suboptimal decisions are made and organizational performance suffers. If Knowledge Traps are the cholesterol of organizations, “connection” is the Statin drug that breaks up Knowledge Traps, restores Knowledge Flow, fosters relationship excellence and keeps both the social and business environment healthy. Connection is especially critical during the difficult times we face today. It helps employees pull together through the tough times rather than retreat into a state of relational isolation, fear, distrust and finger pointing that sabotages performance. There is evidence across many fields of research that confirm the positive benefits of connection and here are just two from the scientific arena. Neuroscience research has established that when stress rises, levels of the stress hormone cortisol rise in the human bloodstream and this biological change can make human beings behave in a reactionary or irrational way. We have seen many examples of these reported in recent years. Feelings of connection reduce cortisol levels to help individuals remain calm and rational, even during stressful periods. Neuroscience research has also shown that feelings of connection boost hormones including dopamine, serotonin and oxytocin that make us feel more energetic, more confident and more trusting of those around us. From the field of psychiatry, we learn that psychiatrists see a steady and growing stream of people from the business world. These patients commonly report experiencing feelings of boredom and emptiness, and they don’t know why. Many begin to self-medicate by seeking thrills that range from taking excessive business risks or sexual risks, to numbing the pain with substance abuse. Professor Manfred F.R. Kets de Vries at INSEAD has also recognized this pattern in his research of CEOs (which goes to show that the dangers of disconnection extend to the C-Suite too). Psychiatrists treat these disconnected individuals by helping them bring more human connection into their lives. The Corporate Executive Board’s 2004 study of 50,000 individuals worldwide established that employees who feel more engaged and connected are 20 percent more productive than the average employee. Just imagine the cumulative effect of an additional day of productivity per week over the course of an individual’s career. The link between our work and HiringSmart is simple: Connection is all about fit – fit with the manager, the role, the team and the organization. You can’t have one without the other. Connection moves people to give their best efforts and align their behavior with organizational goals. It engenders loyalty and increases productivity, innovation and overall performance. Knowing that, it is completely irrational for any organization not to be very intentional about creating cultures of connection. Being intentional about developing task excellence and the relationship excellence that comes from connection is the key to unlocking large reserves of untapped productivity and corporate potential. Michael Lee Stallard and Jason Pankau are co-founders and partners of E Pluribus Partners, a leadership training and development firm. 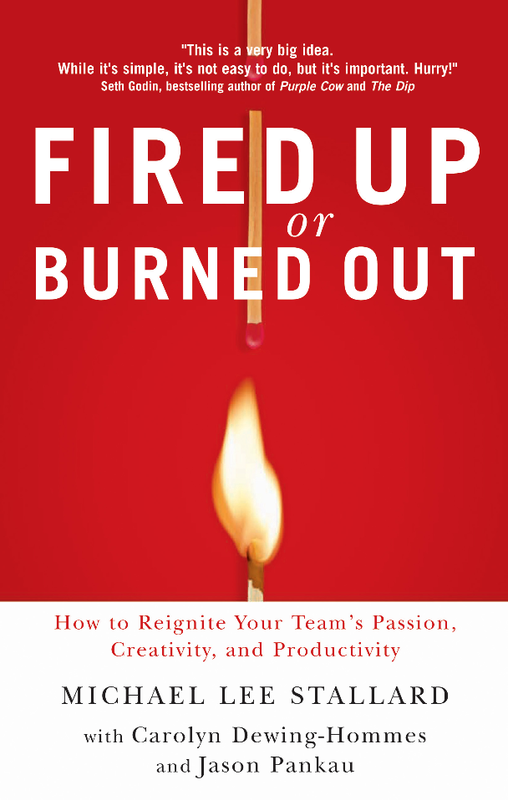 They are co-authors of the best-selling book Fired Up or Burned Out: How to Reignite Your Team’s Passion, Creativity and Productivity. For additional information: www.michaelleestallard.com. Organizations that collect the right information at the point of hire and use it throughout the entire employee lifecycle see sustained improvements in retention, productivity and engagement. Get Your Scary Thrills at the Movies - not at Work! Having the right hiring tools in your recruitment process can help contain the nightmares to October 31.